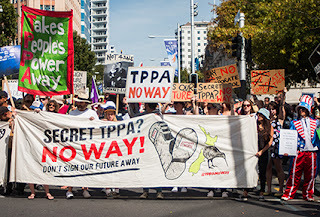 The TPPA protests have been buzzing on my IPhone with live feed of what's happening in Auckland. There are no surprises: I guess we knew it would be something like this. The protestors seem well organised and clearly include contingents from various organisations that have done this before. 'This what democracy looks like', caught my attention particularly. The saddest chant was directed at the police: "Army of the Rich, Enemy of the Poor'. Auckland has of course seen this (and far worse) before - and historians may mention the Queen Street Riots of 1932. Yet we are a small country, and the divisions and the frustrations aroused by the TPPA, and not least the sentiments of the chants, should urge us to take stock of what is happening to us as a people.